Lot:9437 Fr. 2300. 1935A $1 Hawaii Emergency Note. PCGS Currency Gem New 65 PPQ. Fr. 2300. 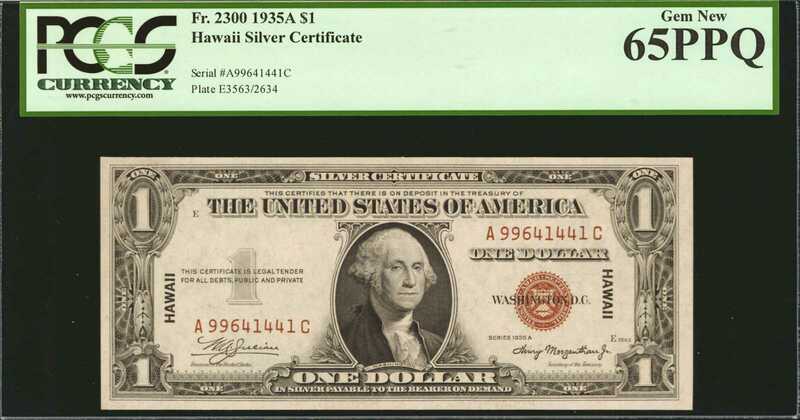 1935A $1 Hawaii Emergency Note. PCGS Currency Gem New 65 PPQ.This rarer A-C block Hawaii $1 is one of the finest graded by PCGS. Well centered and embossed. PCGS Pop 6/3 finer.